Still on the look out for a romantic getaway with your spouse? Want to visit Maldives or Dubai? Read more of these exceptional all-in fares this 2015. Singapore Airlines (SIA) and SilkAir (MI), in partnership with Bank of the Philippine Islands (BPI), Ayala Malls, Globe, Singapore Tourism Board and Changi Airport Group offer an exciting and exclusive array of travel opportunities for passengers this 2015. These promotional fares are for sale until February 28 2015 and for travel from February 1 to December 31, 2015. Customers will get a chance to experience traveling in style at all-in Economy Class fares starting from USD145 to Singapore, USD210 to Cambodia, Indonesia, Malaysia, Myanmar, Thailand, and Vietnam, USD690 to India, USD700 to Australia, and USD 899 to Europe. In addition to those mentioned, passengers can also travel to Hong Kong, Japan, Korea, Dubai, Maldives, New Zealand and South Africa. All Economy Class fares come with complimentary 30kg baggage allowance, gourmet cuisines and KrisFlyer miles that can be used for future travel. 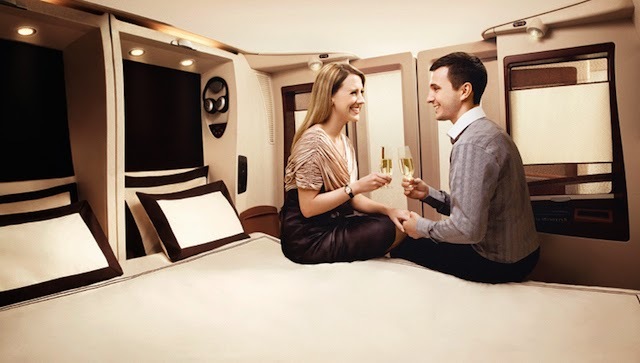 For elevated comfort, customers can also choose to avail all-in Business Class fares to Singapore and Southeast Asia at USD800, to Australia at USD 2,500, to South Africa at USD 3,200, Europe at USD 3,500, and New Zealand at USD 3,800. In addition to that, there are also special Business Class fares to Maldives and Dubai. All Business Class passengers will enjoy complimentary 40kg baggage allowance, gourmet cuisines, lounge access and 125% KrisFlyer miles that can be used for future travel. On top of these great fares, customers can also look forward to a series of exciting travel fairs across the country from February 6 to 8, 2015. Featuring the exclusive Singapore Airlines Suites product, the Singapore Airlines Showcase and Travel Fair will be held at the Glorietta Activity Center, Palm Drive, Makati City while the SilkAir Travel Fair will take place at Ayala Center Cebu. There will also be a SilkAir booth at Abreeza Mall Davao. Know more about the Singapore Airlines Showcase and Travel Fair at their website www.singaporeair.com and www.silkair.com. 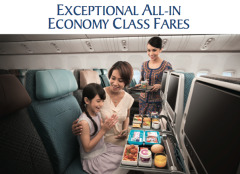 The promotion offers passengers of Singapore Airlines and SilkAir the much coveted on-board comfort and impeccable service at exceptional value fares. To make payments more convenient, BPI is offering a Real 0% special installment plan of up to six months. Glorietta, Ayala Center Cebu and Abreeza Mall shoppers may also avail of the exceptional all-in fares by simply showing proofs of purchase worth P 1,000.00 single or accumulated from January 21 to February 28, 2015. Every Php 1, 000-receipt can purchase one ticket. 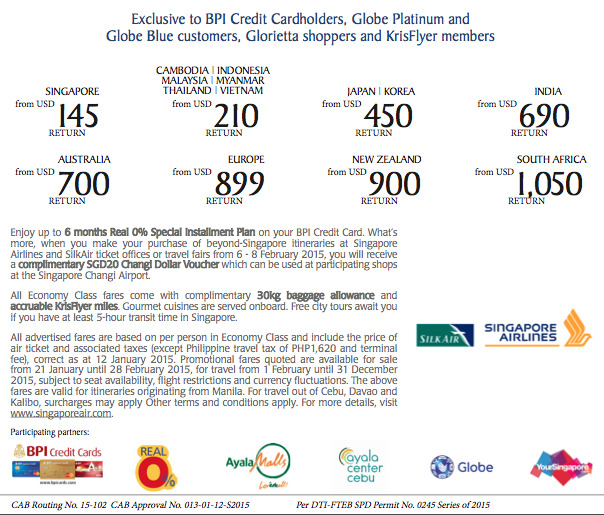 Globe Platinum and Blue customers can also avail of these fares by showing their cards. I've heard a lot of praises about Singapore's food and in-flight services. I hope I could share a personal experience, maybe soon. So, what do you think of these exceptional all-in-fares? Isn't it a terrific travel gifts for women?